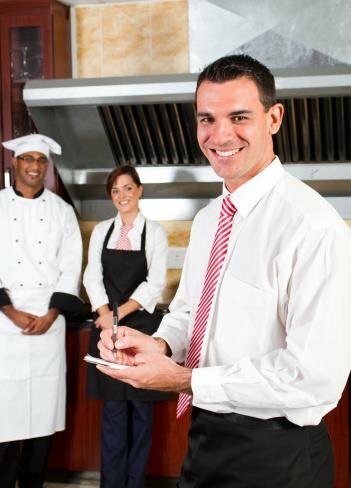 Have your thought about a career as a restaurant manager? Do you find yourself noticing things that could be better about your local restaurants you dine at, only to find them lacking? If you enjoy being around restaurants and food services, you may enjoy this as a career. A restaurant manager is in charge of everything in a restaurant, from the food quality, to health concerns, to staff decisions, and more. If you think you have what it takes, read on. The requirements of a restaurant manager vary, but in general you should possess managerial qualities, such as the ability to lead and persuade people to complete tasks well, motivate staff members to achieve, and multi-task. You should have vast experience in the restaurant business, or at least in the food services business. It helps to have background in the culinary arts and/or a degree or certificate in the Hospitality industry. You will be working closely with different kinds of people, including staff and customers, so it helps if you have some solid "people skills" too. You usually have to start small and grow, but take advantage of every opportunity to jump into manager positions, when the opportunity arises. The typical education route a restaurant owner would normally take would involve a certificate in the culinary arts, public relations coursework, and possibly some courses in the Hospitality industry. Someone who wishes to become a restaurant manager without the above education requirements could alternately work in the foods industry, and collect a portfolio of work, and then move up to a manager position in one of the restaurants they have been employed with in the past. 1) Gain experience in all levels of restaurant work. In order to lead others in the restaurant business, it is important that you understand the business on all levels. So the more experience someone can gain as a waiter, dishwasher, chef, or cashier, the better off they will be when they attempt to move up the ladder to a managerial position. 2) Become a people pleaser. A good manager is good at knowing what the customer wants, and pleasing them. So, whatever level you are currently working on, if you become skilled at doing what the customer wants, you will have a better chance of being seen as capable of manager status. 3) Further your education in your field. Continue to add to your education as you see the opportunity and expand your abilities to include work in the area of public relations and hospitality or advanced chef training. The more you can position yourself to do all things well, the more others will notice you as a potential manager. 4) Ask for recommendations from former employers. Collect recommendations from employers of various restaurants, and make sure you do a good job at every job your hold. This way, your trail of good work will follow you and you will be able to support the idea that you have the experience and skills behind you to manage a restaurant effectively. 5) Work into the Assistant Manager position first. Many managers are moved from Assistant Manager to Manager. So if you can, work into the Assistant Manager position and show your stuff there. Then you will be more likely to be chosen should the Manager position open up later on. Becoming a restaurant manager is mainly a series of career steps, which begin with working on the bottom rungs of the ladder and working up. Little by little, you will establish your credibility and reputation as a reliable leader, after you have the accumulated experience in the other levels of restaurant work. You usually have to start small and grow, but take advantage of every opportunity to jump into manager positions, when the opportunity arises. It also helps to keep your education current and to focus on ways to make yourself more believable as a manager by increasing your skills in all areas. Remember the goal of the manager is to make the business work. You do not usually own the business, but you must act as if you do, and care as much about its success, as if it were your own.